F.Y.I. Pau Gasol is NOT Soft!! We like to argue about which team dominated the 2000’s. I say it was the Lakers: six final appearances, four titles. He thinks it’s the Spurs: Three trips, three titles, perfect record. As you can see, he’s always wrong. Lately, what we argue the most about is Pau Gasol. Tommy likes to call him “Chicken Man” a) because he looks like a chicken and b) because he’s “scared” to play down low with the big boys (aka Tim Duncan). Okay, he may resemble a chicken at times but one thing is for sure, Pau Gasol is certainly not soft! Chris Dudley is soft. Kwame Brown is soft. Eric Dampier is soft. Pau is so far above these guys it not even funny. The Lakers were better after Gasol’s arrival than they were before he showed up. Think about that. 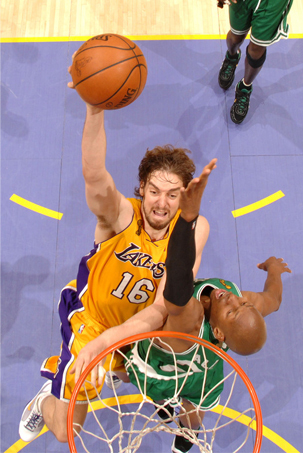 Gasol come to the Lakers midway through the 2007-2008 season and they rolled right into the NBA Finals. Unfortunately they lost to the Boston Celtics in six games. But they go right back to the Finals the next year and beat the Orlando Magic in five games. Currently the Lakers are three wins away from heading to the NBA Finals for the third straight year. Tim Duncan may be the best power forward ever to play the game and Pau matches up with him in every category. In 12 seasons in the NBA, Tim Duncan’s stat line looks like this: 21.1 PPG, 3.2 APG, 11.6 RPG with 50% shooting. Gasol’s stats look like this after eight years in the league: 18.8 PPG, 3.2 APG, 9.0 RPG with 52% shooting. As you can see, Gasol matches up nicely with Duncan. And Pau is only 29. By the time his career is over I’m sure he will match Duncan in every category, including NBA Championships. So if you still think that Pau Gasol is soft, then, like my brother, you are wrong. And possibly adopted.